Escape from Salad, Low FODMAP Caper Chicken! Add all ingredients except chicken together and mix well, put into a plastic bag or container for marinating then add chicken. Let marinate for 24 hours in the fridge. Remove chicken from marinade and cook for 20-30 minutes until tender and not pink. Then enjoy. This stuff is SOOO GOOD! All Scream for Ice Cream! I can’t even begin to imagine my life without my friends. Not only because of all the great times, laughs and support they provide, but in their endless help is invaluable. My diet still embarrasses me often, in my thinking that I am an annoying “problem” but my friends have assured me time and time again that no, it’s not a problem, it’s a delightful challenge. Last night one even said something to the effect of “You know it’s awesome when I find something that you haven’t heard of that you can eat it’s like Oh Yeah” visualize this being said with a nice celebratory arm pump decorated with a huge gorgeous grin! This made me smile. And why were we talking about this as we munched on corn chips in a tofutti sour cream/salsa mix (aka Secret Sauce), followed by an awesome chicken and rice recipe? Because there was a new discovery for dessert for me! Oh yes, Almond Milk ice cream topped with brandied peaches (home made of course). I was beside myself with joy. Only a few short months ago I was introduced (by the arm pumper) to Coconut Milk Ice cream which is a delight, but another option with different flavors. ROCK ON! Just in time for Summer! So delicious is seriously SO DELICIOUS! It’s a miracle. Ever since I stopped with the Lactose I have missed dessert. Yes there are things I can enjoy like meringue or fruit, but there is something about a wonderful creamy mousse that I really love. Then I learned about Coconut Milk. Seriously this is incredible. 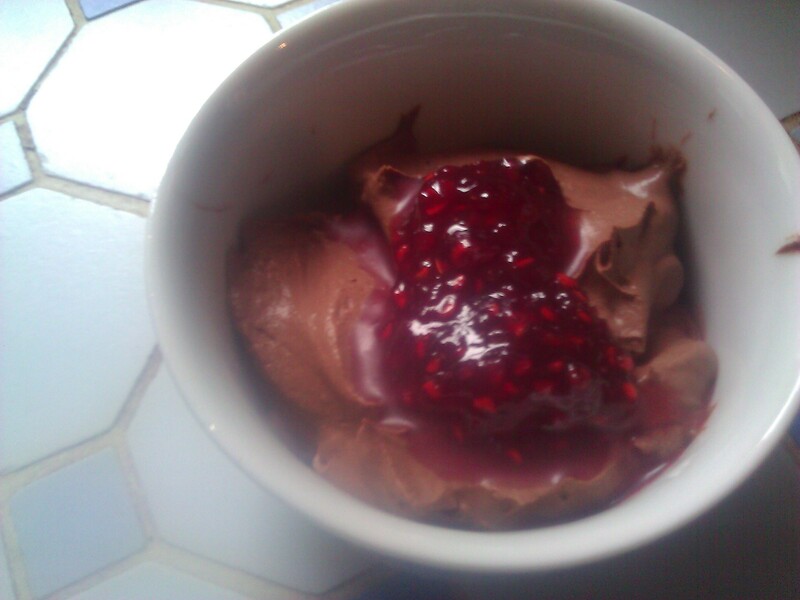 Completely lactose free super creamy mousse that takes about 5 seconds to make. Are you ready? Put it back in the fridge for an hour if you can, the flavors seem to settle better. Eat and enjoy. I love to scoop out a small amount and put fresh berries or Jam on it. I’ve heard you can also use this as frosting! Donut Make a Bad Decision! Have you ever had that tough morning where nothing goes your way? It’s a slew of little things so you feel like you have no real right to be upset but you are super ticked off? Yeah this morning was that morning for me. The dog wouldn’t come in, in fact she ran all over the yard to avoid me, which made me leave for work late. Then the dry cleaners couldn’t find the slacks my boyfriend needs for a wedding we’re going to tonight, The ATM had issues with the check I was trying to deposit, Traffic was worse than usual, etc… You know that day. Not a good start. Then I got to work about a half hour late and what happens? Of course, it’s Friday, the day filled with those horribly tempting boxes of donuts and other baked goods. They’re like a Trojan horse for me… they look all sweet and innocent than BANG they wreak havoc on my belly! I saw them sitting there, my jelly filled love right in the center of the box and I thought “Well heck, why not? It’s not like my day can get much more annoying.” I reached for it and stopped. I realized that it would make my already rough start for a day even rougher. So guess what I did… I walked away and grabbed a bag of sweet dried apple chips. Sweet, tasty and friendly to the belly. I’d say this was a win of a donut battle, at least for me! I’ll bet someone else here eats those belly achin’, 8 Weight Watcher points right up! 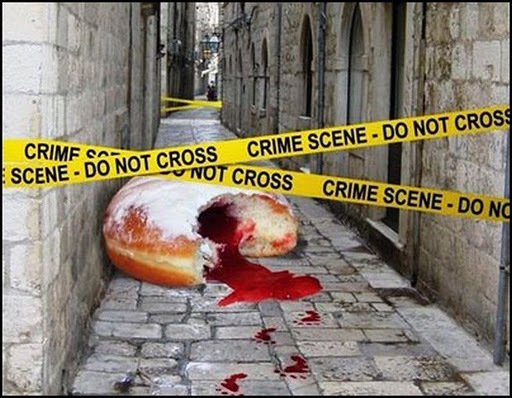 DISCLAIMER: No Jelly Donuts died by my hand to create this post.